Electrohype is organizing an exhibition with artists presenting work on the Macintosh Classic II computer. The exhibition will take place at Electrohype-ROM in Malmo, Sweden during the period December 12st. 2003 and January 23th. 2004. The idea is that the exhibition will focus and reflect on the development both in computer based art and the accelerating demands on hardware used to create and present art. Due to the characteristic design of the Classic II computer it will of course also focus on the software and hardware joined together as a work of art or maybe more precisely an art object. "In the rush to try to be on top of the minute-by-minute advances of the digital medium, there is seldom time for reflection. With the pace of technological change, the creative process becomes one of reacting to all the latest developments in programming. All too often, the exhilarating sense of freedom to communicate, coupled with the latest and showiest techniques, plug-ins and engines, seem to determine the concept and aesthetic of content." These issues raised by Tamas Banovich seems just as applicable today as seven years ago, if not even more. Going to new media festivals today often means that you will see huge computer controlled installations and projections accompanied by 5:1 surround audio. Too many of these works tend to be more experiments with expensive hardware and new technology than actually dealing with art and artistic content. This is very unfortunate, not only for artists with a serious approach but also for the audience and the genre itself. If computer based art continues to move on this track we will quite soon be left with only a bunch of expensive theme park installations. On the positive side one can note that lately there have been some focus on software art and code. One could suspect that the reason why this topic suddenly is focused on, even at big festivals, is related to the problems mentioned above. Software art and coding is not something easily approached by new media art charlatans and low-end artists. It requires substantial insight and knowledge. The process of working with software art itself is also a kind of slow process allowing, or forcing, the artist into a different artistic pace, a pace different from the easily approached artworks that are generated by off the shelf software. 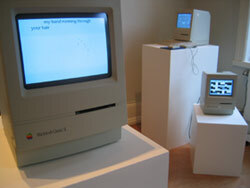 The exhibition was also an experiment with issues concerning buying and selling computer based art. Most artists working in this field is familiar with the various aspects of this issue. There has been endless discussions, proposals for solutions and so on but the fact still remains that computer based art is rarely or never bought and sold, at least not in Scandinavia. By implementing the artwork in a small stand alone unit it might be possible mobilize an interest for computer based art among art collectors and institutions. This might appear as a provocative issue to focus on, especially in Europe but maybe it is just time to try out an economic model in real life. Infact Thuesday January 13 Kultur Skåne desided to buy a computerbased art work from the exhibition of the amerikan artist Torrey Nommesen. Electrohype consider this as small but a importent step. Electrohype have a nice collection of Classic II and SE 30 computers. The Classic II and the SE 30 is basically the same computer with a few variations regarding FPU etc. In some parts of the world the Classic II was also sold as a Performa 200. The computer runs on a Motorola 68030 processor at 16Mhz- twice the speed of the Classic. A typical configuration is somewhere between 4 - 16 Mb RAM, the operating system itself consumes 1,5 - 2,5 MB. Hard disk is typically 40 Mb with 15 -20 Mb free space. The built in monitor has a maximum resolution of 512x384 pixels at 1 bit. Note that 1 bit is Black and white - not grayscale. The computer runs on Mac OS 7.1 It is perfectly capable of running QuickTime, Director, HyperCard and web browsers, just step back a few years in version history. The Classic II is equipped with a floppy drive and a SCSI port. Art works should therefore be submitted on floppies, Syquest disks or ZIP. It is also possible to provide a download address and let us transfer the material to a suitable media for installation. Kvarnby Folkhögskola for donating several Classic II computers for the project.